﻿ ﻿ ﻿When Meghann and Joe planned their wedding at the Desert Botanical Garden in Phoenix, they knew they wanted to make it their own - they bucked tradition in favor of their own innovations, and they showcased their creativity and tapped into the talents of their close friends. 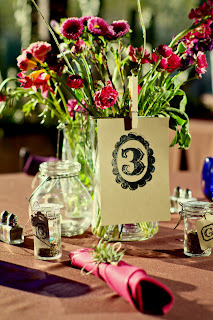 And by embracing the DIY ethos, they were able to save a fortune and still throw a gorgeous and memorable wedding. Meghann gave herself some time to binge on a few wedding magazines - but she looked to them for inspiration, then tossed them and set out to make the wedding of her dreams, not the dreams of the wedding industrial complex. She was disheartened by most of the wedding books out there until she stumbled across Offbeat Bride by Ariel Meadow Stallings, which she swears by. Once she and Joe started to narrow down what they had in mind for their wedding, they started using an Excel spreadsheet to keep track of costs - she says you will always spend more money than you think you will, but it helps to see it all there in black and white. 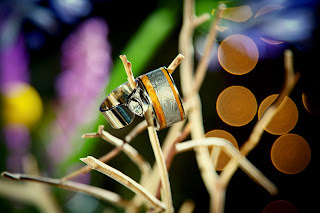 The wedding bands: Joe's interior detail is meteorite. 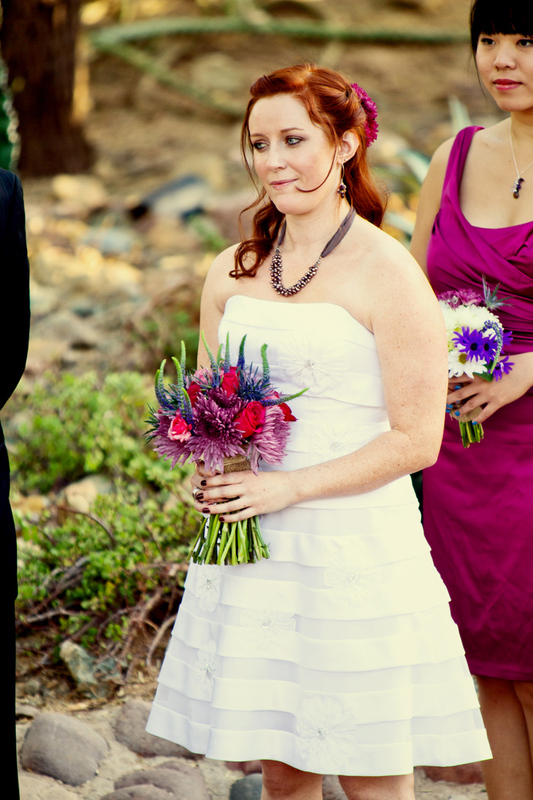 ﻿ Meghann suggests doing all your own planning, rather than hiring a wedding coordinator, but she strongly encourages arranging for a day-of coordinator. 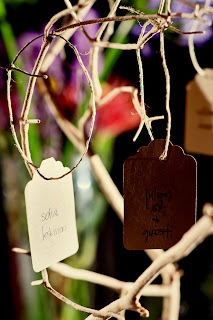 Meghann chose Stephanie, a designer friend of hers, to be her point person - she had a clear idea of the couple's vision and could field questions about where to put certain decorations so that the bride and her mom wouldn't have to drop everything and fuss over every detail. Meg says that if you press a friend into service, you should still be sure to pay them or give them a generous gift for all their efforts. Finally, Meghann's advice for the planning process is to delegate - expect the groom to pull his weight. Get his input on big decisions, and don't be afraid to ask him for help when you're feeling overwhelmed. "You want your man to feel like it's his wedding, too. A stressed woman is no fun to be around, so as your to-do list grows, give him a list of specific tasks you know he can do." Meghann's friend Julian, also a designer, created all the signage and print materials at the reception. From the table numbers to the place cards and the labels on the guest favors, Julian's letterpress design tied it all together and gave it a sophisticated DIY feel. Since the reception was held in the Wildflower Pavilion at the Botanical Garden, wildflower seeds were the perfect wedding favor. The couple picked up small jars at Michael's Hobby Store and massive amounts of wildflower seeds, and then set up shop in their living room with their friends, filling and labeling the jars. The jar itself is a sweet keepsake, and what a great way to celebrate their first anniversary, by watching their flowers bloom in your own garden! Meghann wanted her bridesmaids to look and feel great in their wedding attire - so instead of forcing them all into the same cut and color of dress, she gave them freedom to choose a dress they loved in a spectrum of colors - they were instructed to stick to jewel tones like cobalt blue, purple and fuschia. Then Meghann gifted them matching necklaces for the ceremony. The groomsmen wore matching suits, and could pick ties that would coordinate with the lady they'd be walking down the aisle. The effect was great - the colors really popped and played off each other, and the ladies all looked confident and happy walking down the aisle. One of the most brilliant innovations at the wedding were the boutonnieres Joe made for his groomsmen. 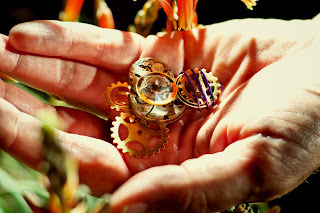 Meghann says they were jointly inspired by some Lego man boutonnieres they saw, and some steampunk watches they had seen on Etsy.com. "We ordered the watch parts from Etsy and Joe used his skills with soldering and building electronics to make the LED-lit custom boutonnieres using vintage watch parts." Each piece was stylish and unique - an amazing keepsake. but the rest of the arrangements were DIY. ﻿ Joe says one of the best things about getting married in a beautiful, natural setting is that you don't need to spend as much money dressing the place up - but of course flowers were a really important element for the couple. Meghann says, "I got a quote from a floral shop to do all the flowers and I about died. It was $2,000. To save money, I bought about $400-worth of my favorite flowers from a grocery store floral department (Which, by the way, buys you A LOT of flowers). Then I bought my bouquet for $120 and some specialty flowers for $100 or so that were not available at the grocery store." The morning of the wedding, she delegated a few friends to do the flower pick-up, and then she and her bridesmaids assembled the flowers, creating the rest of the bouquets and the centerpieces. It was a little stressful, and in retrospect she would not have driven herself to the wedding and delivered her own flower arrangements, but it all worked out in the end; they had gorgeous arrangements of Meghann's own design and for less than a third of the price! Joe laughs remembering that they were so busy rushing around that they forgot to eat before the ceremony. By that point they were starving, and the reception was hours away. In hindsight, stashing some emergency snacks would have been a great idea. Joe is a musician - not a dancer. Rather than suffering through the traditional first dance as man and wife, Joe thought it would be more personal and meaningful if he performed a song for Meghann - "The Promise" by When in Rome. It was a really beautiful moment in the evening. However, Joe would like to point out that if you're going to do this, you should try to remember to *record* the performance. Whoops! 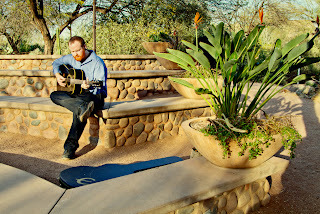 ﻿Joe also handled the music for the ceremony, by asking a talented friend to play some instrumental pieces on guitar. 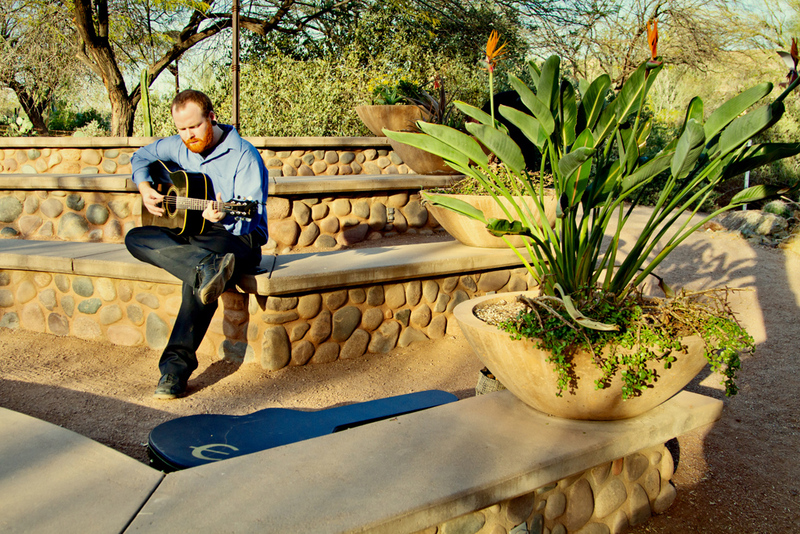 It was lovely sitting in the desert amphitheater with the sun beginning to set, waiting for the bridal party to arrive and listening to some sweet melodies. One tradition the couple happily discarded was the overpriced wedding cake. Instead they served up an assortment of fresh-baked cookie platters. They were simple to serve, a fraction of the price of a cake, and they were able to have a nice variety. Everyone wins. 10. Don't Book Your Honeymoon Flight for 5am the Next Morning! !